What do you do with a ship that is considered to be out of date? Sell it to a Turkish company, over the internet, to be recycled into pots and pans. The aircraft carrier HMS Invincible is on her last legs. She fought in the Falklands and the Balkans and Iraq. But what do you do with a ship that is considered to be out of date? The answer: sell it to a Turkish company, over the internet, for £2M (US $3.2M) to be recycled into pots and pans. Who knew? The British Navy regularly decommissions aircraft carriers and other ships as they become out of date and replaced with newer models. This one was taken out of use after 25 years of Navy service. 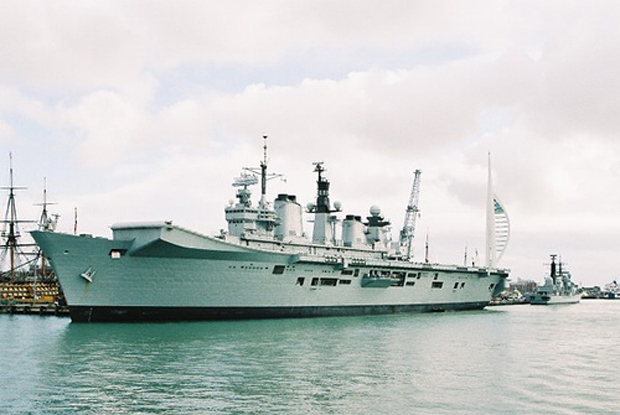 A Ministry of Defence spokesman said: “After 25 years of service HMS Invincible was decommissioned nearly six years ago and having reached the end of her distinguished career, it is right that we secure a good financial return for the taxpayer. The bid from Leyal Ship Recycling does this and also ensures she is disposed of in an environmentally friendly way.” It will take 8 months to dismantle the ship. Turkey has taken a lead role in environmental recycling in the shipping industry. Given its location on the sea, there has always been a business doing this. However in the late ’80’s environmental awareness became an issue and there was pressure from European ship owner clients to clean up their act and deal with hazardous wastes and pollution. Twenty one recyclers formed the Turkish Ship Recyclers Organization which has become the place to go for green-conscious shipping companies. Because Turkey wants to become a member of the EU it looks towards Europe for its customers and regulations. Turkey is the only non-European country that has signed up to these new environmental restrictions. It is a tough slog, especially in recessionary times, because rates are cheaper in Pakistan, Bangladesh and South Asia. Oh yes, in case you want one too, they are all listed on the edisposals website. The HMS Ark Royal is up for sale now, as are three more destroyers. Going like hotcakes.